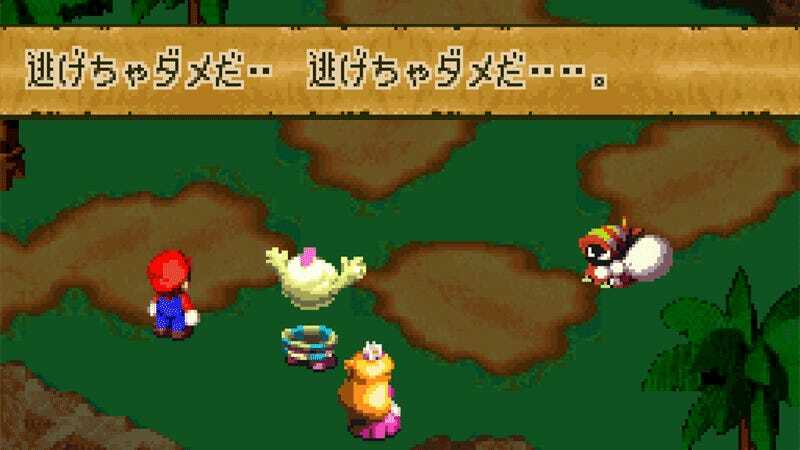 They’re missing from the English-language version, sadly, but the original Japanese release of 1996's Super Mario RPG on the SNES features a bunch of enemies who are very into Dragon Ball, Sailor Moon, Neon Genesis and even a Sega game. As Legends of Localization point out, when the game was translated into English, a lot of pop culture references that were present in the Japanese version—most of them being uttered by the game’s enemies—were left out. Translating the Japanese edition in 2019, however, lets us all enjoy these giant dorks as Square originally intended. A Crook who copies Shinji’s “I mustn’t run away” line from Neon Genesis. The Knife Guy/Clown Guy bosses repeat lines from Giant Robo: The Day the Earth Stood Still. A Pulsar pays tribute to Sailor Moon’s “you will be punished” catchphrase, which was incredibly popular in Japan at the time of Super Mario RPG’s release. A Buzzer is a big fan of Jojo’s Bizarre Adventure. Every fight with Jinx has some kind of pop culture reference, but the first encounter has Akira’s “You’re ten years too early!” line from, of all things, Sega’s Virtua Fighter. Valentina is another Neon Genesis fan, uttering Ritsuko’s “He’s a small man” line. There are also multiple Gundam references, and even tributes to pop music and advertisements. Sadly almost none of them made it into English version, sometimes because the size of the Japanese text wouldn’t fit into the English display boxes, but mostly because it’s clear (from the tone of translations, in any case) that the translator simply didn’t get the reference. If you’d like to waste half a day watching videos of the source gags then seeing how well they’ve been slid into the game, Legends of Localization have a full breakdown, along with comparison pics of the two versions of the game.